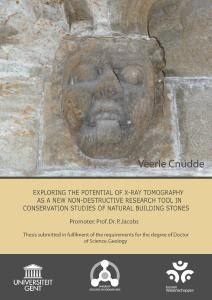 Veerle Cnudde, Exploring the Potential of X-ray Tomography as a New Non-destructive Research Tool in Conservation Studies of Natural Building Stones, Ghent, Ghent University, 2005. The mean purpose of this study was primarily the exploration of the possibilities of the non-destructive X-ray micro-CT technique in the domain of conservation and restoration of natural building stones. Special attention was paid to more specific topics like visualization of conservation products inside natural building stones, determination of porosity and pore-size distribution of scanned samples and monitoring of artificial weathering processes. Additionally the influence of conservation products on the original properties of stone material was also studied. High-speed neutron tomography was introduced as a new non-destructive visualisation technique and tested for its potential in fluid-flow research inside building materials. Anne-Laurencee Dupont, Gelatine Sizing of Paper and Its Impact on the Degradation of Cellulose During Aging. A Study Using Size-exclusion Chromotography, Amsterdam, Universiteit van Amsterdam, 2003. The issue of permanence and durability of paper is one of the major concerns in cellulose research and paper conservation. From the perspective of conservation research, the understanding of the long-lasting properties of paper begins with the investigation of the characteristics of papers in good physical condition that have best survived the passage of time. In European papermaking history, this is the case with early papers, which for the most part, present far better state of conservation than papers of more recent origins. Several facets that could explain the longevity and stability of paper have been investigated in the past, but one that has been largely neglected to date is the process of sizing. Papers dating from the fourteenth to the eighteenth centuries, in addition to having been fabricated from good quality fibres which partly explains their durability, have also inn common that they were sized almost systematically with gelatine. The present study is dedicated to the investigation of the role of gelatine in pure cellulose paper. The research is approached mainly from the angle of polymer chemistry. The impact of gelatine sizing upon aging on the molecules of cellulose, and the changes incurred by varying the sizing material are studied. The analytical technique selected is size-exclusion chromatography (SEC), which is employed in the characterisation of both cellulose and the gelatine, and in thee investigation of their degradation upon aging. Model papers were fabricated for this purpose, but the study also includes the characterisation of naturally aged papers. Maria Vaz Pinto d’ Avillez, Part I : Comparing derivatization methods for amino acids – one and two-step procedures using gas chromatography – flame ion detector (GC-FID) Part II: Story of an icon from its execution until its conservation, Lisboa, Faculdade de Ciências e Tecnologia da Universidade Nova de Lisboa, 2008. Two derivatization methods were tested in twenty-one standard amino acids (AAs) for further identification and quantification by the analytical technique of Gas Chromatography with Flame Ion Detector (GC-FID). For the one-step derivatization reaction N-methyl-N (tert.- butyldimethylsilyl)trifluoroacetamide (MTBSTFA) was used and for the two-step reaction we used hydrochloridic acid (HCl) and trifluoroacetic anhydride (TFAA). We obtained better results with the derivatization procedure in two-steps, although it takes longer, and we concluded that the reproducibility of these reactions is difficult to achieve. Hugh Hudson, Re-examining Van Eyck: a New Analysis of the Ince Hall Virgin and Child, Melbourne, The University of Melbourne, 2001. The Ince Hall Virgin and child is a painting of the Virgin and Child in an interior that was attributed to Jan van Eyck by the leading historians of early Netherlandish art from 1854 to 1956. Between 1956 and 1959 the work was subject to a technical and art historical analysis in Europe, in the re-classification of the work as a copy by a follower of Van Eyck, and possibly a forgery. Subsequently, a number of art historians have suggested that not even the composition of the work is Eyckian, and that the work is a pastiche based on Van Eyck’s paintings. Nevertheless, some authors have doubted the arguments for these reattributions. Some authors maintain the attributions to Van Eyck, and others suggest that the work may be a copy. This thesis is the first comprehensive critical reappraisal of the scientific and art historical analysis to be conducted. In the first chapter it examines the provenance and bibliography of the work. In the second chapter it examines published and unpublished documents relating to the technical analysis found in Melbourne, Brussels, London and Amsterdam, which have been brought together for the first time. It also contains an interpretation of the work’s infrared reflectography that was produced, for the first time, for this thesis. It is argued that, contrary to the 1950's analysis, there is no technical impediment to an attribution of the work to Van Eyck. Furthermore, technical analysis reveals numerous correspondences to Van Eyck’s works, in the pigments, paint layer structures, underdrawing style and pentimenti. In the third chapter the relationship of the execution, composition and iconography to Van Eyck’s paintings is discussed. It is argued that the execution, composition and iconography are closely related to Van Eyck’s works. In the fourth chapter the attribution of the work as an original painting of Van Eyck, a copy, a pastiche or a forgery is discussed. It is concluded that the balance of the available evidence suggests the attribution of the work to Van Eyck, or his studio, is justifiable. The possibility that the work is a free copy is not excluded, but is undermined by the numerous correspondences to Van Eyck’s materials and technique and its relationship to the versions of the composition by other artists. A seguinte tese de doutoramento está livremente disponível aqui. 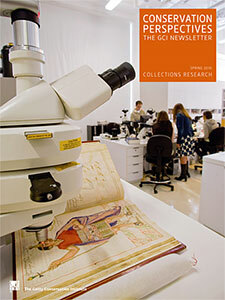 Rosemary Anne Goodall, Spectroscopic Studies of Maya Pigments, Brisbane, Queensland University of Technology, 2007. The Maya of Central America developed a complex society: among their many achievements they developed a writing system, complex calendar and were prolific builders. The buildings of their large urban centres, such as Copan in Honduras, were decorated with painted stucco, moulded masks, carving and elaborate murals, using a range of coloured pigments. In this study the paints used on the buildings of Copan and some ceramic sherds have been investigated, non-destructively, using micro-Raman spectroscopy, micro-ATR infrared spectroscopy, environmental scanning electron microscopy with energy dispersive X-ray analysis (ESEM-EDX) and FTIR-ATR imaging spectroscopy. The paint samples come from four buildings and one tomb covering three time periods in the four hundred year history of Copan. The main pigment used in the red paint on these samples was identified as haematite, and the stucco as a mixture of calcite particles dispersed throughout a calcite-based lime wash stucco. The composition and physical nature of the stucco changed through time, indicating a refining of production techniques over this period. A range of minor mineral components have been identified in each of the samples including rutile, quartz, clay and carbon. The presence and proportion of these and other minerals differed in each sample, leading to unique mineral signatures for the paint from each time period. Green and grey paints have also been identified on one of the buildings, the Rosalila Temple. The green pigment was identified as a celadonite-based green earth, and the grey pigment as a mixture of carbon and muscovite. The combination of carbon and mica to create a reflective paint is a novel finding in Maya archaeology. The high spatial resolution of the micro-FTIR-ATR spectral imaging system has been used to resolve individual particles in tomb wall paint and to identify their mineralogy from their spectra. This system has been used in combination with micro-Raman spectroscopy and ESEM-EDX mapping to characterize the paint, which was found to be a mixture of haematite and silicate particles, with minor amounts of calcite, carbon and magnetite particles, in a sub-micron haematite and calcite matrix. The blending of a high percentage of silicate particles into the haematite pigment is unique the tomb sample. The stucco in this tomb wall paint has finely ground carbon dispersed throughout the top layer providing a dark base for the paint layer. Changing paint mixtures and stucco composition were found to correlate with changes in paint processing techniques and building construction methods over the four hundred years of site occupation. Signe Vahur, Expanding the Possibilities of ATR-FT-IR Spectroscopy in Determination of Inorganic Pigments, Tartu, University of Tartu, 2010. The present work focused on expanding the possibilities and usefulness of micro-ATR-FT-IR spectroscopy in identification of different inorganic pigments in historic artefacts. Most of the pigments used historically in paintings and other artefacts are inorganic compounds. ATR-FT-IR has found limited use for determination of inorganic pigments, because the mid-IR (4000–400 cm–1) region of the IR spectrum of many of them is not characteristic enough and also there are many pigments that either do not absorb in that region at all (oxides, sulphides, etc) or have absorptions that are at the low wavenumber end of that region and are not characteristic enough for pigment identification. So, many pigment materials absorb IR radiation in the far-IR region (below 500 cm–1). In contrast to the mid-IR region the far-IR region has traditionally been significantly less accessible for routine IR spectroscopic measurements. However, recent advances in instrument design have brought the wavenumber range below 500 cm–1 well within reach of commercial FT-IR equipment. Nevertheless, this wavenumber region has up to now found almost no use in investigation of historic artefacts. In this dissertation 47 most widespread inorganic red, white, yellow, blue, green, brown and black pigments were examined. An analytical method for determination and identification of these inorganic pigments in paint layers by micro-ATR-FT-IR using the wavenumber region of 550–230 cm–1 was developed. The advantages and limitations of the ATR-FT-IR and developed analytical method of the analysis of inorganic pigments in the low wavenumber were discussed. This work provides a comprehensive overview of the inorganic pigment identification possibilities using ATR-FT-IR as well as a collection of reference spectra in the low wavenumber range (550-230 cm-1) and is expected to be a useful reference material for conservation practitioners and material scientists. The usefulness of ATR-FT-IR in the region of 550-230 cm-1 for identification of inorganic pigments is demonstrated by 5 case studies on art objects (several of them are important in Estonian history). Richard Prikryl, Ákos Török (ed. 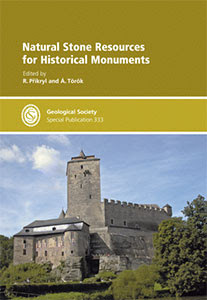 ), Natural Stone Resources for Historical Monuments, London, The Geological Society, 2010. B. J. Smith, M. Gomez-Heras, H. A. Viles, J. Cassar (ed. 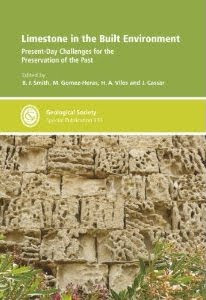 ), Limestone in the Built Environment: Present-Day Challenges for the Preservation of the Past, London, The Geological Society, 2010. Já há alguns dias que foi publicado o 1.º número de 2010 da revista Conservation Perspectives - The GCI Newsletter. Está livremente disponível aqui. Há poucos dias ficou livremente disponível online a revista e-Conservation, n.º 14, de 2010. Está aqui. Marta Teixeira Vieira, O Casaco Dourado de Jean Paul Gaultier (n.1952-): Conservação de Alta Costura (MUDE - Colecção Francisco Capelo), Lisboa, Faculdade de Ciências e Tecnologia da Universidade Nova de Lisboa, 2009. Pretendeu-se com esta investigação conservar o casaco dourado de alta costura criado por Jean Paul Gaultier (Arcueil, n.1952), que faz parte da colecção Francisco Capelo, actualmente integrada no MUDE – Museu do Design e da Moda (Lisboa, Portugal). Para conservar esta obra realizou-se um estudo histórico-técnico-artístico procurando preservar os valores e funcionalidade da obra. Este é um estudo inovador na conservação de têxteis contemporâneos dado que esta é uma obra complexa de grande singularidade e composta por uma grande diversidade material e procurou-se conhecer os materiais, a intenção criativa de Gaultier e os processos de degradação da sua obra. Para tal, recolheu-se informação sobre o casaco e a alta costura do criador em inquéritos à Casa Gaultier (Paris), entrevista ao coleccionador, através de contactos com diversos museus internacionais, e recorrendo a bibliografia e vídeos sobre os desfiles do criador. O estudo do casaco e das causas da sua degradação requereu uma caracterização material detalhada, para a qual se recorreu a diversas técnicas de exame e análise como a microscopia óptica (M.O), radiografia, a µ-EDXRF, a espectroscopia de FTIR, a HPLC-DAD-MS e ainda ICP-AES, o que permitiu delinear um plano de conservação adequado. Este plano incluiu medidas de conservação preventiva do casaco, a consolidação de elementos decorativos e o estudo de possíveis filmes protectores para a peça, testando nano filamentos de silicone e revestimentos de sílica produzidos pelo método sol-gel. O estudo aqui apresentado permitiu minimizar a perda de elementos decorativos da obra e testar formas de reduzir a degradação futura do forro. Permitiu ainda obter filmes hidro-repelentes e bastante homogéneos que poderão ser uma protecção futura adequada para o casaco, sendo apenas necessário testar a longevidade dos filmes obtidos em réplicas para garantir a conservação a longo prazo da obra. Joana Cristina Vaz Pedroso, Estudo da Degradação de Óleos Secativos, em Tintas de Amadeo de Souza-cardoso, Silva Porto e Gustave Courbet, Lisboa, Faculdade de Ciências e Tecnologia da Universidade Nova de Lisboa, 2009. Neste trabalho foi feito o estudo da degradação de tintas de óleo e da influência dos pigmentos e cargas na sua degradação. Os casos de estudo são tintas envelhecidas naturalmente, recolhidas da paleta de Silva Porto, da tela “Floresta Fechada” do pintor Gustave Courbet, e ainda dos tubos de tinta de Amadeo de Souza-Cardoso. Dado a cronologia de vida destes artistas, foi permitido estudar a evolução da degradação de um óleo secativo num período de 150 a 100 anos, até hoje. Foi verificada a existência de um padrão de degradação, que se traduz na formação de ácidos carboxílicos e sabões metálicos. O ião chumbo apresenta o maior poder catalisador na formação destes produtos de degradação. Este estudo foi feito por µ-Espectroscopia de Infravermelho por Transformada de Fourier, usando a 2ª derivada como método adicional, o que facilitou a interpretação de dados. Foi ainda feita a caracterização molecular de algumas cores da tela “Floresta Fechada” do pintor francês Gustave Courbet, e finalmente um estudo da composição de pigmentos ocre, que provou ser bastante útil no estudo da degradação das tintas de óleo.